Here is whole world to discover! 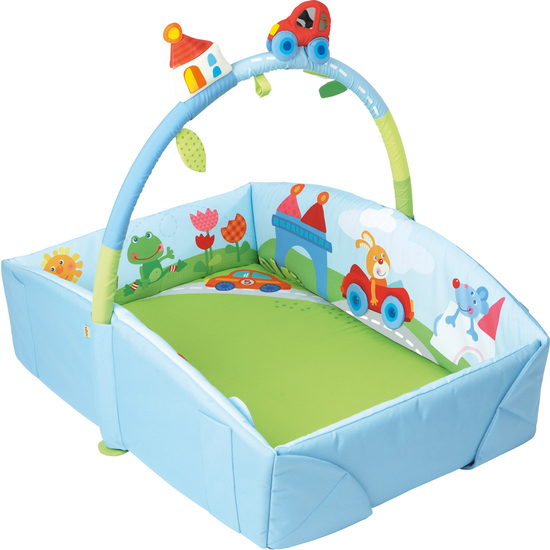 The mouse, frog and bunny play in the cheerfully colorful Dream city, while an abundance of play elements such as squeaker, crackling and reflecting foils entertain baby and stimulate his senses. Folding up the sides, equipped with loop and hook attachments, turns the play surface into a small bed or changing surface. A clutching toy or clacking figure can be easily affixed to the detachable play arch.